Life is full of criticism, be it from yourself or others, and the workplace is no different. While most criticism from your employer is intended to help you improve your productivity, it is sometimes difficult to swallow without feeling defensive or even insulted. But being able to accept criticism for what it is and using it for self-improvement is a testament to your character—even more so those who can absorb it and come back for more. The fact of the matter is that most people will not let you know what they truly think about you and when someone does try to deliver an honest opinion, it is typically watered down to the point where it is nearly useless to you. This habit of sharing only sanitized criticism has stunted the ability for most people to separate constructive criticism from destructive, seeing it only as a mass of vanilla words coating a useless vanilla meaning. • People have a psychological tendency to only focus on the most memorable piece of information they receive during a period of time. This means that most people tend to exaggerate the extent to which a piece of criticism describes who they are. The key is to balance the critic with all of the other feedback you receive on a regular basis and understand that it is just a tiny part of a greater whole. • If you are being evaluated for a performance review or other critique of your work, keep the focus on your behaviors not your characters. Let the evaluator know that you want to hear suggestions for how you can improve your methods. • Accept constructive criticism for what it is: opinionated feedback. Don’t convert a criticism into something absolute. 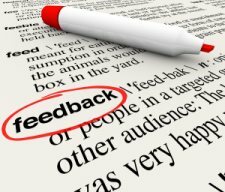 Critical feedback exists only to help highlight perceived weakness and strengths and is not necessarily accurate. You can always disagree with a given piece of criticism. • Try to desensitize yourself to harsh criticism by actively seeking out as much as possible. Harsh doesn’t imply mean or insulting, but it does refer to criticism that may reveal weaknesses that you wish to deny or may cause you to feel embarrassed. The more criticism you receive, the less likely one comment will be to hurt you. Useful criticism will also allow you to see yourself more objectively. • Encourage people when they give you honest feedback. • Don’t try to justify yourself in the face of criticism; you don’t need to. Criticism is simply a form of feedback and is not placing blame or calling you out. • Translate criticism into positive ways for you to improve yourself. Discuss your thoughts with the person giving the criticism to let them know that you can handle it and are using their feedback for self-improvement.